Clarets skipper Tom Heaton has been ruled out of tonight’s Europa League clash at Aberdeen. The England international aggravated a niggly calf problem in Monday night’s friendly win at Preston, and hasn’t travelled north with the squad. 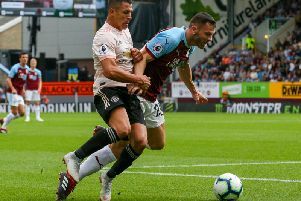 It is a blow for Heaton, who hasn’t played a competitive game since September, when he dislocated his shoulder against Crystal Palace at Turf Moor. Nick Pope, who only returned to training on Tuesday, after a brief break after the World Cup, is in line to start, with Anders Lindegaard also an option. Boss Sean Dyche explained: “He’s got a niggly calf, he hasn’t travelled. It is cruel luck for Heaton, who saw Pope force his way into the England World Cup squad in his absence, and Dyche: “We thought he would be ok but it was niggling on and now we have to be careful. “Of course these games are important, it’s a real competition, but we’ve equally got to make sure players are fit for the season, which is two weeks away. “We want a full squad ready for a Premier League season so there is that delicate balance between pushing people enough to get through that, but if there’s any doubt and they have to stay away from the game then we need them fit for a longer view. Burnley are well stocked in the goalkeeping department, but Dyche is well aware he needs more options to bolster the rest of his squad: “We’re ok at the minute across the pitch but we are diluted so we do need support and we need to get bodies in. “It’s not just getting them in, it’s getting them fit as well.